WorkBoard, the pioneer of Enterprise Strategy and Results Management, today announced it has closed a $23 million Series B investment led by GGV Capital with participation from M12 (formerly Microsoft (News - Alert) Ventures), Workday Ventures, Floodgate, Opus Capital and other existing investors. The investment round comes on the heels of more than 3x revenue growth in 2018, rapid expansion with existing customers and the launch of a popular OKR Coach Certification program. New financing will enable WorkBoard to deepen its investment in the platform and technology and grow its sales and services organizations to meet increasing demand for the only operational OKR offering for large enterprises. "To be competitive in fast-changing markets, organizations must continuously adjust their strategic priorities and drive lateral alignment on them to create the most impact. It's a pervasive challenge that can become an existential threat," said Deidre Paknad, CEO and co-founder of WorkBoard. "The traditional people-and-PowerPoint approach to alignment and accountability fails at scale and speed. WorkBoard enables organizations to cohesively align, measure and drive an active strategy at market speed." WorkBoard customers include high-growth companies scaling rapidly such as Malwarebytes, Go1 and Influitive as well as high-scale companies that must drive higher growth such as Cisco, Reliance Industries, Transamerica (News - Alert), GE and others. With today's investment, WorkBoard has raised more than $35 million to help enterprises achieve their growth plans faster and more efficiently. "Alignment on outcomes is quickly becoming the gating factor on company growth and it's fundamentally a CEO issue. WorkBoard has a superb understanding of this challenge and provides a compelling solution in its results platform and consulting services," said Jeff Richards, managing partner at GGV Capital. "They've assembled a powerhouse enterprise leadership team to lead the category they've created, so we're pleased to be a part of their company-building." Return investor M12 and new investor Workday Ventures reflect the importance of this new solution category to large enterprises and WorkBoard's early leadership in it. "WorkBoard's impressive growth is a reflection of the market, the solution and the team," said Priya Saiprasad, WorkBoard board member and principal at M12. 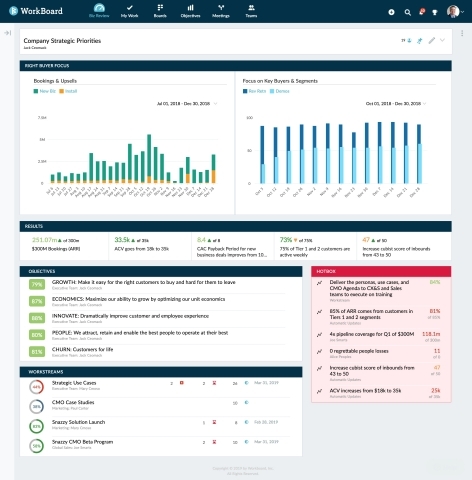 "We are excited to continue supporting WorkBoard in their quest to be the leading enterprise results platform at a time when objectives and key results are becoming the alignment norm for large, nimble enterprises." WorkBoard is the pioneer of Enterprise Strategy and Results Management solutions and the only OKR offering for large enterprises. While every business has strategic priorities and an urgency to achieve them, few have a systematic, data driven and reliable process to evolve those priorities, get everyone aligned on them, drive results and measure progress. WorkBoard's Strategy and Results platform enables high-growth and high-scale companies to align on outcomes and cohesively measure results across the organization. Customers relying on WorkBoard include Microsoft, Reliance Industries, AmTrust, Samsung, 8X8, Disys (News - Alert), Intellidyne, eSilicon, EDMI, TrendKite, Influitive, and others. For more information, visit www.workboard.com or follow the company on Twitter (News - Alert) @WorkboardInc.